The H10 has been perhaps the greatest mainstay of the resistance against iPod tyranny for the past couple of years. With simple controls, a ton of features and solid construction, it showed the late iPod Mini the door and, size aside, stood nose-to-nose with the Nano. There's quite a weight on the X20's rather slimmer shoulders, then. Though a dramatically different device to the H10, it's largely a success. It's a real shame the sturdy metal body's been replaced by flimsy-feeling plastic, but at least it's lighter as a result. There's been some careful consideration about the interface, resulting in this being one of very few players to ape the iPod's signature wheel control. It has physical rather than touch-sensitive movement and is annoyingly undersized - the large or imprecise of finger may struggle with it - but it works. Especially as the menus are also circular. Rather than the flat textual list of the iPods or Zens, it's a ring of subtle icons (some of which aren't entirely obvious at first - the downside of a pictorial approach) that are highlighted in accord with your movement of the wheel. There's something pleasingly complete about this, and using images rather than text means you can use the X20 either horizontally or vertically. A revised version with larger controls would make this a much better player, though. The X20 has totally severed mandatory ties with the horrible iRiver Plus software that's blighted so many of the firm's previous players. It's included as an option, but this is a Plays For Sure device, so you can stick with the clunky but simple Windows Media Player to manage your music instead. There's no need, like the iPod or Sony, to install extra software onto your system. Video support isn't quite such good news. MPEG-4 is supported but in a stupidly specific format, so in practice it's the increasingly common tale of WMV only at 320 x 240. So, you'll need to have Windows Media Player re-encode pretty much any video you want to copy to the X20. Although this is automatic and doesn't require your intervention, it can take ages depending on your processor, plus installing third-party codecs on your system sometimes means Media Player will get itself in a muddle and be unable to re-encode any more. If those two factors don't turn out a problem for you, the X20's really not bad for video watching. The image quality isn't fantastic, but having a larger screen than most other Flash-based players means you can realistically watch an entire film, although it'll still mean a bit of squinting. Charmingly, there's even a couple of speakers in the back of the player, so you can use it without headphones if you're in a quiet place. What shines the most here is that the X20 has an expansion slot. You can stuff a MicroSD card in there and as much as double its capacity instantly. 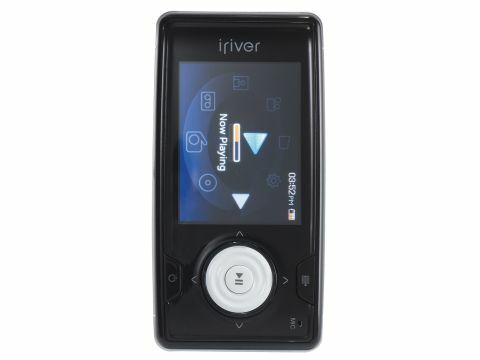 Given you can pick up a 2GB card from www.play.com for £14, the iRiver becomes a value for money victor on the quiet.